This page records legacy video work from the naughties when I used to create video works and VJ. I realise now that anyone with an iPhone can with the right app an do much better video editing work but back then it was different. (keep checking this page because as I write this in 2018 In will produce new work). I started making videos when I was studying at University to document my work and to create video art as I was inspired by Bill Viola and Pipilotti Rist. At the same time I was also part of the Montreal club scene and I remember I also became more involved as a promoter and learnt a lot about what made the atmosphere for a good party. I then started using my visuals for parties and became involved as a VJ at SAT doing nights with Jan Pienkowsy. 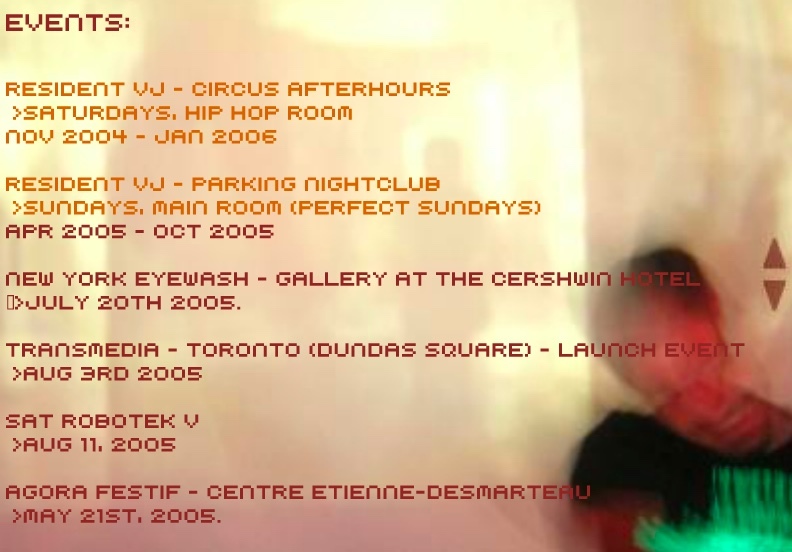 I started VJing professionally as VJ Fluid from 2004 to 2006 in various clubs in Montreal and also traveled to perform in New York, Mexico City and then eventually in London. 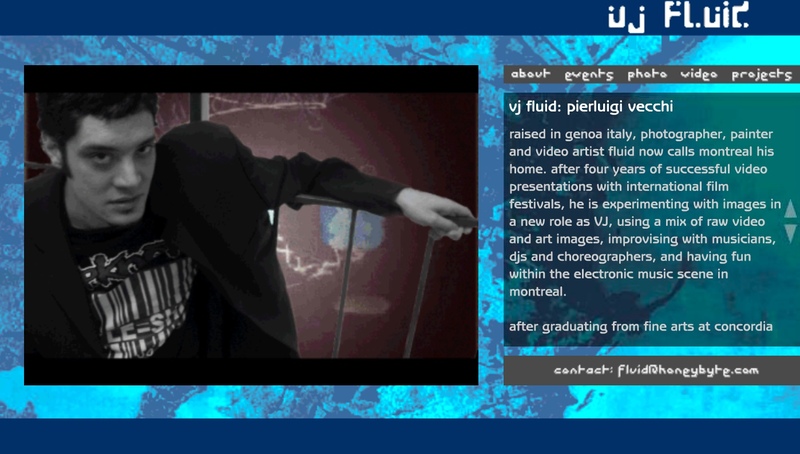 This was my first video as a solo artist presented at Image & Nation Film Festival in Montreal. It explores issues of loneliness and alienation in urban settings alleviated by a fleeting sense of connection through technology at the beginning of the chat room culture. I don’t have much material left from that time but I here are are sone VJ loops I found. Above bleury-dundas from Pierluigi Vecchi on Vimeo. Cinderella from Pierluigi Vecchi on Vimeo. L’avion from Pierluigi Vecchi on Vimeo. Placenta from Pierluigi Vecchi on Vimeo. This is one of my video portraits of my friend Noriko. Noriko from Pierluigi Vecchi on Vimeo. Snow from Pierluigi Vecchi on Vimeo. War is not the answer from Pierluigi Vecchi on Vimeo. I finally did visuals again after a very long time at Night Sheen I experimented by projected onto the ceiling as the space was tight. I paid tribute Paris Is Burning remembering the iconic movie that more than 25 years later. I only have this 25 second vid but here you go… it was great fun!